Welcome, Contax, Contarex and Zeiss Lovers, to our new website! 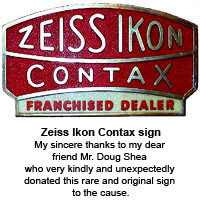 Zeisscamera.com is the premier site for restoration, repairs, maintenance, custom modifications, advice and information about your Zeiss Ikon Contax cameras, lenses and accessories. Custom machining and repair parts are available in conjunction with service and overhaul work performed here. In depth information about the operation and inner workings of the Contax cameras is freely available. I provide the highest possible quality services to the Zeiss Ikon Contax line of cameras. These services range from cosmetic repair to complete overhauls. Your service needs for your camera can be completely fulfilled here. You will find the highest possible quality and service available anywhere in the world for your valuable Zeiss Ikon Contax cameras, lenses and accessories. Whatever service you need for your ZEISS IKON Contarex, Contaflex TLR, Nettax, Contessa, Contina, Colora, Ikonta, Super Ikonta, Nettel, Super Nettel, Contax I, II, III, IIa, IIIa Black Dial or Color Dial Model, Bessamatic or Ultramatic and Contaflex SLR- you will find it here. Contax, Contessa, Contina, Super Ikonta and other Zeiss Camera Lightmeters overhauled and new photocells are available. A very advanced Contax collector residing in Australia has decided to downsize and is offering the majority of his collection of Contax II and III bodies along with a very large assortment of lenses for sale. Everything in his collecton has been overhauled here and comes with a one year guarantee. Over the next weeks all of these will be put up for sale on this website. The first offering is an overhauled Contax II outfit that includes the 50mm f1.5 Sonnar, 35mm f2.8 Biogon and 135mm f4.0 Sonnar lenses. Twice a year the famous LeicaShop camera store in Vienna Austria holds the highest level camera auction there is. You will find all kinds of goodies and rarities there. The completely illustrated auction catalog is available for viewing online. You can register and bid online. There are two auctions a year. Auctions of photgraphs and of camera equipment. The photograph auction is on November 24, 2018. You can register and bid on these iitems on the Internet so take a few minutes to take a look inside the greatest photography camera show on earth. Here is a link to the auction catalogs for the most recent auction and all previous auctions. These auction catalogs are the most accurate camera and lens valuation tool there is. There are a lot of questions about the Post WWII Contax IIa and IIIa cameras that have gone unanswered because of the lack of authoritative documentation. 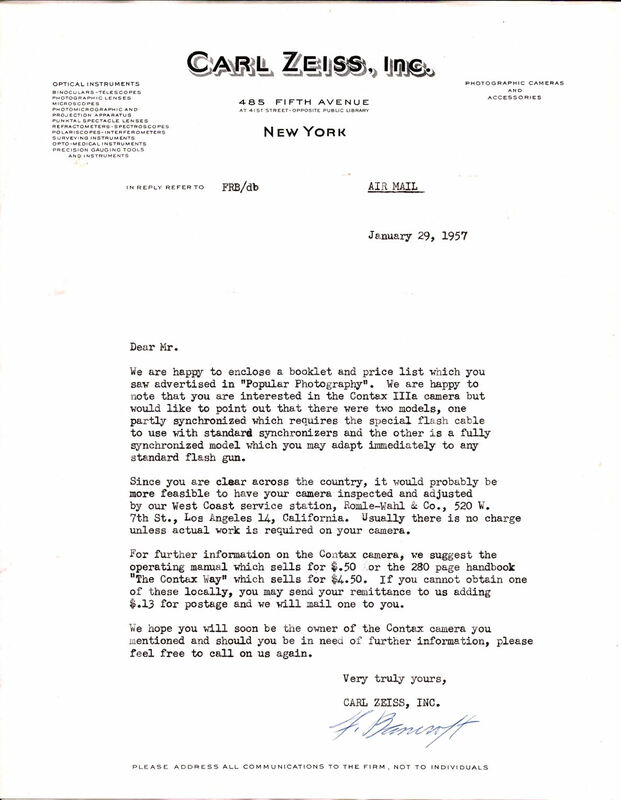 Recently a Carl Zeiss Inc. letter to a customer from 1957 became avaiable and it is provided here for you to read. It answers the questions as to the differences between a Color Dial and Black Dial camera, whether they were sold at the same time, and many other issues of interest to people wanting to know more about the Contax. This is an old picture of a camera store somewhere in the USA prior to World War II. It's about the Contax II. 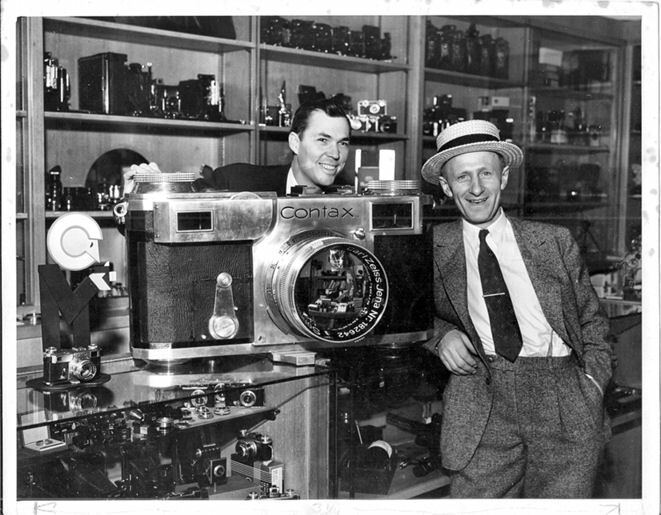 You can see there is a new Contax II on the display case, a salesman and another man holding a Contax II advertising piece. 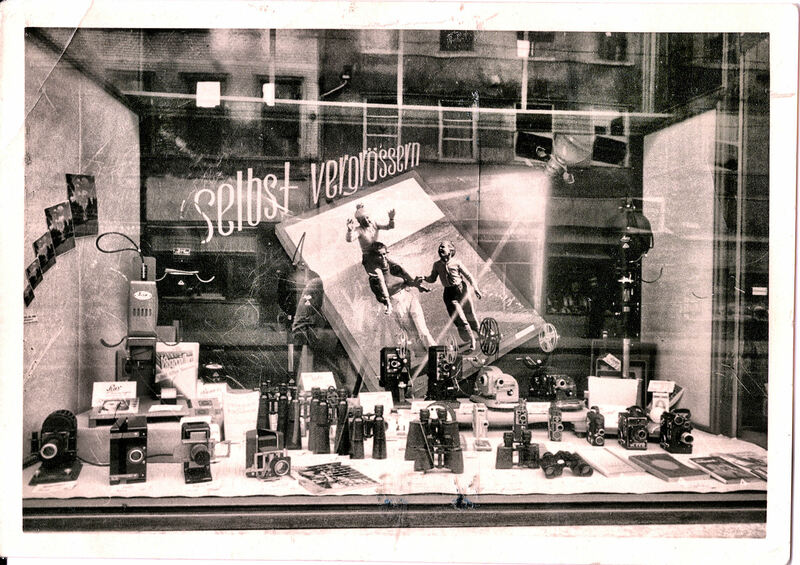 These huge store displays were given out to authorized Zeiss Ikon dealers and were made to be hung on the wall. They've all disappeared by now and this picture is the only picture of one of these Contax II store displays I've ever seen. I beiieve the other man is the local Zeiss Ikon Factory Sales Representative. It would be nice to be able to identify the camera store and the two gentemen in the picture. If you can provide this information please contact me by email using the link provided below the picture. This picture is low resolution. You can download a high resolution copy of this picture by clicking on the link beneath it. There are some interesting things in the display case that are visible in the high resolution image. The first warning part 1: Over the years I've found the lens repair customers are very concerned about the "feel" of the focusing controls of their lenses. The usual reason I'm approached about a lens is a sticky focusing control. The feel of a lens depends upon its use history and the grease used to lubricate it. I've seen a lot of lenses and a lot of these have been serviced recently. In the lenses that have been serviced recently I've found one of two conditions regarding focusing thread grease in them. Both are bad. The first is simple mahcine oil has been applied to the old dirty grease to give it new life. This temporarily returns the lens to its original feel so there's no problem with customer complaints the problem is this causes accelerated wear because the old grease is still dirty and worn out. The second condition is the use of drugstore Vaseline to lubricate the lens. Vaseline gives any lens a wonderful feel but Vaseline is not a lubricant. It will not protect focusing threads from wear and it promotes accelerated wear. I have yet to see a recently serviced lens that has the original maker's grease in it or anything like the original makers grease. The results of this search convince me a very great number of people are setting up home lens repair business. I've seen their work. It's very easy to pour oil into a lens to loosen it up and to remove the front lens element and clean it so that it looks like something good was done to it. It's also obvious that if you visit one or more of the popular Internet camera web sites and ask for help with your lens or a recommendation of a person to help you there will be no shortage of shills employed by camera butchers anxious to help you. These people also offer very attractive rates. Ebay search "lens Repair Book"
Believe Zeiss. Zeiss will advise you with the purest truth and honesty. Experience has taught me truth about camera and lens repairs is a very scarce thing on the Internet camera chat sites. They are all full of shills, hacks, liars and camera butchers. To put it another way they are a bad place to try to get good advice. Back in the 1960's there was a popular term used in camera shops to describe a bad work repair shop. it is "Camera Butcher". This term isn't used these days but it is still very appropriate. The camera repair field was, is and will always be full of camera butchers. They will tell you anything to get you to put your precious gear into their rotten hands, ruin your gear, do incompetent or incomplete work and then take your money. Back then there were far more camera butchers than there were honest shops and the same holds true today. German made Zeiss Ikon cameras are the best picture taking and making cameras that have ever been made. With the recent resurgence in the interest in film photography serious photographers are looking for high quality Zeiss Ikon cameras to use. The problem is that wherever there is a demand for a thing of value there will be counterfeiters, liars, frauds, thieves and confidence swindlers in abundance. In order to avoid being stung one must be very careful, patient and educated. The most sought-after prized and loved Zeiss Ikon camera is the Contaflex TLR. Recently one was presented here that is a stark warning not to be too hasty to reach for your money when a good looking Zeiss Ikon camera appears in front of you. The camera shown below could have been restored but the cost would have been about $4,500.00 in parts and labor. 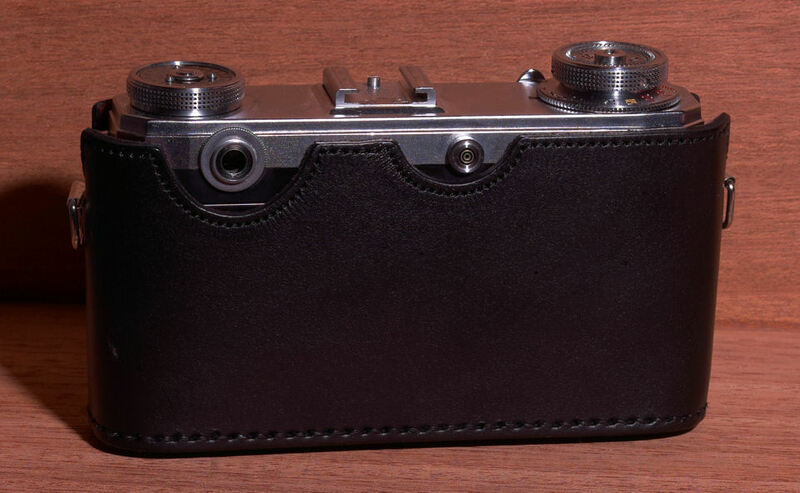 This TLR had been carefully prepared for sale and it looked great until the newly painted leather was taken off of it. Never ever buy a used Zeiss Ikon camera without a firm return and refund agreement with the seller. Always pay using a method where you can force a refund if things don't go as expected. Above all things buy in the USA and accept shipment by the U.S. Post office only. If you buy from outside the USA you are just naked. 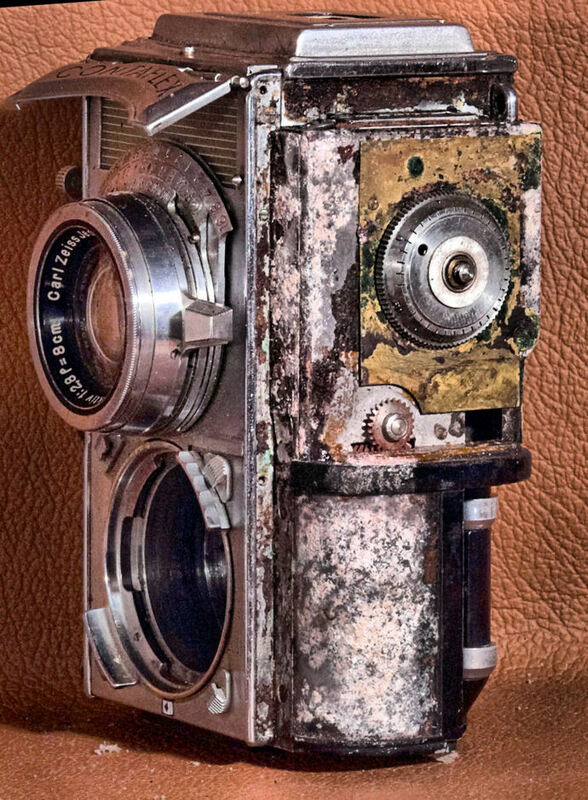 As you can see this camera is covered with extensive and deep corrosion. This exactly what to expect from the Netherlands. A defective un repairable light meter has been deliberately installed in it. The leather was badly cut. Many screws are missing or replaced with non-original screws. The camera was dropped and the original light sensor cover has been replaced with a cheap plastic replacement. The lens elements have all been badly etched by acidic mold. This camera is a miracle of the worst possible work. This camera is a nightmare for the owner and for me. Please take my advice and buy nothing out of Europe and in particular NOTHING from the Netherlands, ever. It's just not worth the risk. My warning about these Netherlands cameras is applied to Europe because these wrecked cameras are also sold there and can indirectly wind up on Ebay USA. This is an amazing site. All kinds of film are available for sale on it. These include just about every type of film including many discontinued films that have been freeze stored in every size and manufacturer.. Infared in color and black and white as well as spooled movie film are available here. This is an extremely comprehensive site well worth your time and patronage. Please use this link to vist the Film Photography Project web site. Find out What Is In the Contax IIa Box? 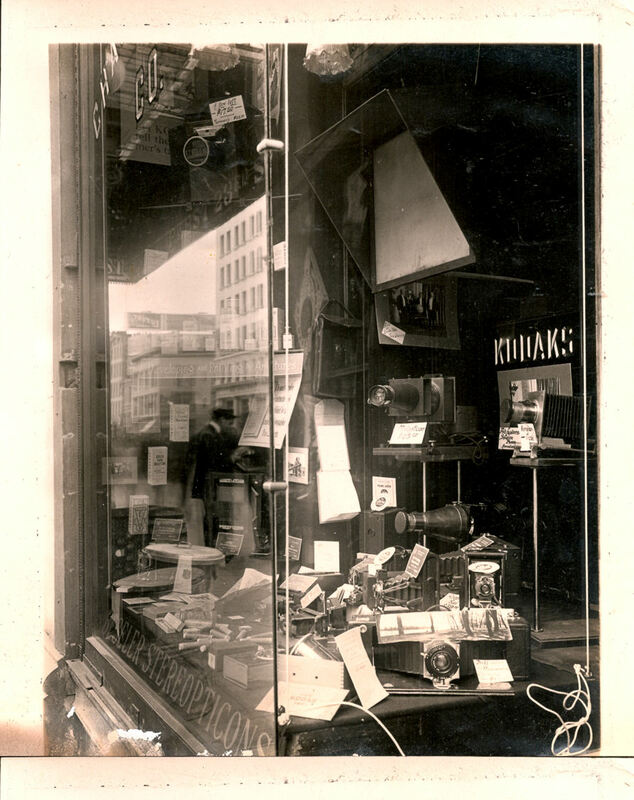 A photograph of a camera store window from the 1913 time period has come to light providing a powerful view into the very early American camera scene. There are a lot of wonderful things in this fascinating shop window and it is well worth downloading and exploring in detail. Just click on the link beneath the small picture below to download the full detailed 1.5 Mb file. This picture appears to be a photograph taken of a man picking up his photo finishing taken by a friend. It wouldn't surprise me if this picture was also picked up at this same camera store. Just look at that beautiful panoramic camera right up front. Wouldn't you like to have it? 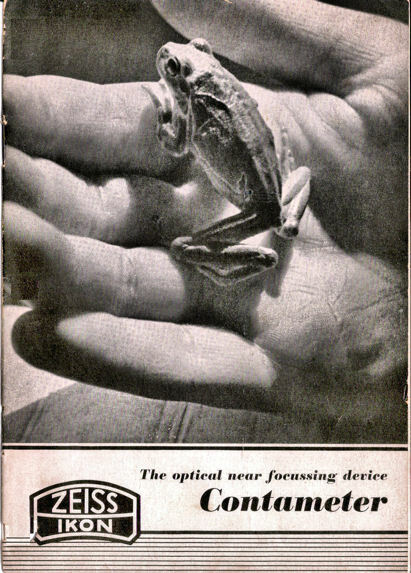 In 1939 Zeiss produced a small pamphlet containing a wealth of advice still highly relevant today about light meter usage, film speed rating, and shutter type efficiency. This is a little four page pamphlet that is well worth studying carefully because it is packed with good ideas, great advice and valuable information. 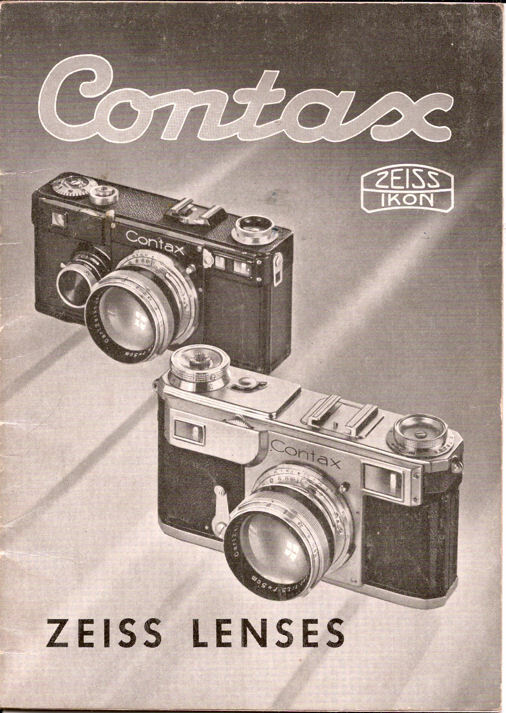 This brochure was published in 1936, the year of introduction of the Contax II. It completely lists and describes all of the very many accessories available for the Contax I and Contax II. 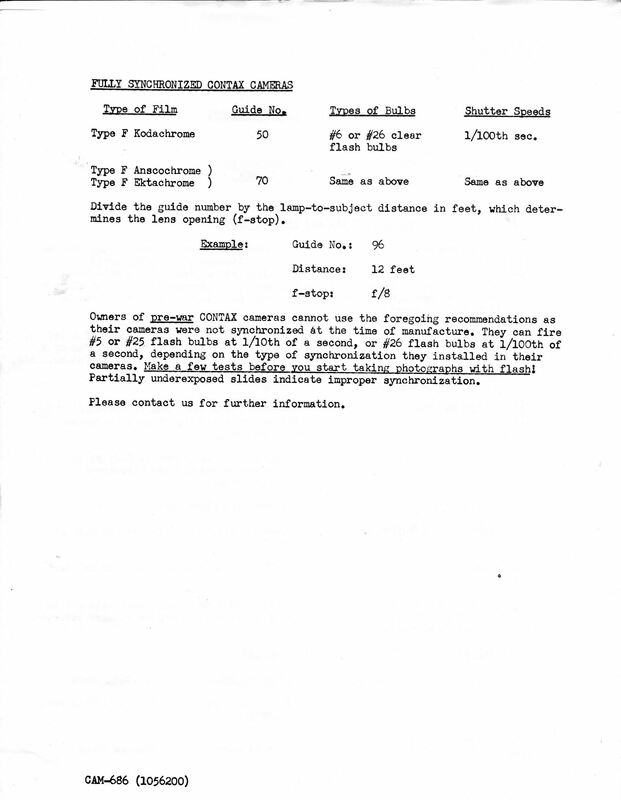 This is the most complete and comprehensive Contax II document found yet far. It's in Pdf format and is available for free download using this link. It's a 24 page document consisting of a 7.5mb size file so it may take some time to download. But if you are interested in the Contax II and every accessory and lens, some quite rare and special, made for it this is the document for you. This is a photo taken a night of a lit camera shop window in 1939. It is a pure Zeiss Ikon display showing all of the Zeiss Ikon cameras and popular accessories available at the time. This is a very enjoyable photograph to explore. The original is a small photograph measuring about 2.5" x 3.5". There is also a little bit of blur because the camera taking the picture was hand held for a fairly long exposure. But you can see and identify the cameras and lenses along with the posted prices. There are a lot of good things to see in this picture. It is a wonderful thing and a very rare and special window into the past. The version of this picture posted here is a very low resolution. If you want to explore this shop window more deeply just click on it and download a 1mb version with far more detail. I also have to say the Mercedes picture in the back of the display above the Contax II is particularly worth looking at. Zeiss covered the area of close up photography with its Contax I, II, III, IIa, IIIa, Contaflex TLR, Super Nettle, Tenax and Super Ikonta cameras with a great variety of accessories including the Contameter. It is the most available and least expensive today. This accessory kit remains a mystery to many modern Zeiss camera owners. The problem has been the instruction booklets for the Contameter are very rare. A copy of the completely informative Contameter close up accessory brochure that was printed in 1938 recently became available and so it is presented here for you to download for free. 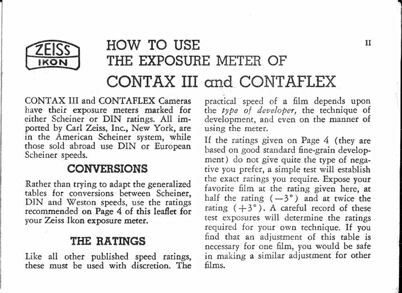 While this brochure was printed in 1938 the Contameter was manufactured after World War II for the Contax IIa, IIIa, and Super Ikonta cameras and these instructions and directions apply to them also. Additionally, all of the accessories described in this booklet were also manufactured after the war although not necessarily with the same catalog numbers. There has been a lot of interest in the Carl Zeiss lenses made during and immediately after World War II. There has also been a fair amount of discussion about the source, quality and optical goodness or "bokeh" of these lenses. The following photograph was taken by the U.S. Army of the Zeiss Jena factory complex on April 17, 1945. This is a newly released Army Signal Corps photograph that has not been seen or published before. it tells the entire tale and this is that every lens that came out of Germany from 1942 to 1951 was a miracle produced by shell shocked bombed out people living in starvation and every other kind of privation in the basements of bombed out buildings. This picture helps to answer the question about where the Leica Thread Mount (LTM) Carl Zeiss Jena Sonnar lenses came from. I believe these lenses were made one at a time by Zeiss by its most skilled prototype machinists. 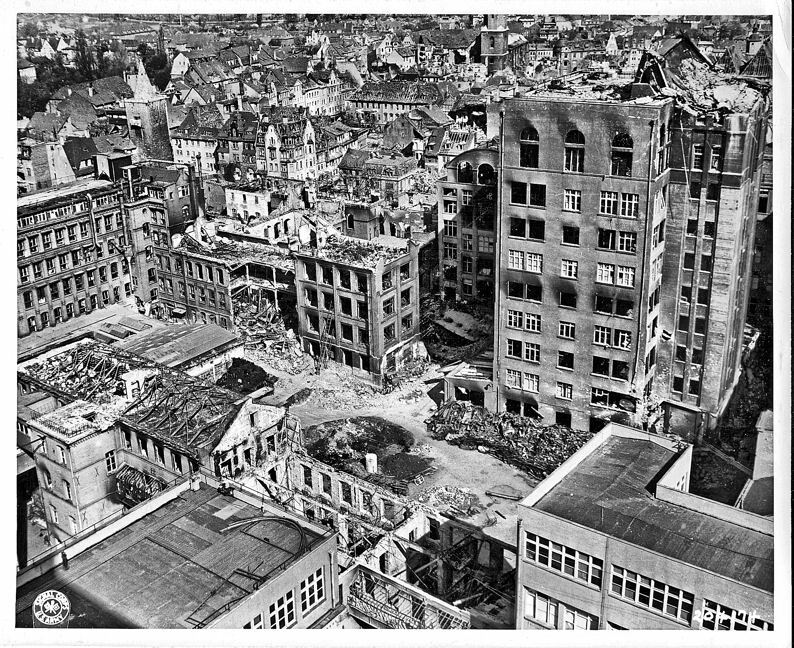 At the end of the war the Zeiss Jena and Dresden factories and document centers were ruined, but the Leitz works were intact. Zeiss could not make a camera and its workers were starving. 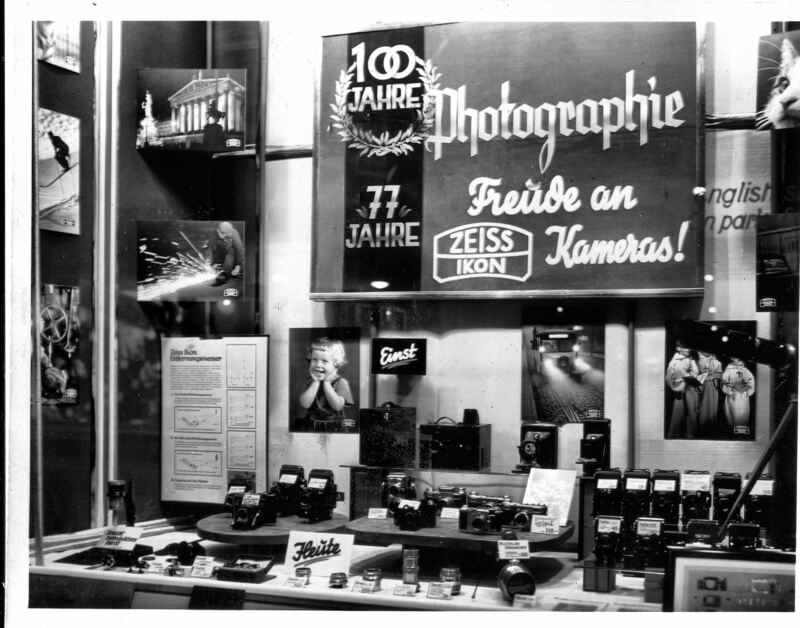 I believe that In order to make money to feed its people Zeiss, for a short while, made lenses to fit the Leica cameras that were being made and sold at that time. Once Zeiss was able to make cameras again there was no need to make LTM Sonnars and so they were discontinued with production never being resumed. This picture also goes a long way to answer the question about the optical goodness of lenses from the mid war to postwar period. Experience has taught me that some of these lenses are the best Zeiss ever made and some are the worst. The only way to find out exactly what kind of lens from this time you have is to have it thoroughly cleaned (a dirty lens will not perform well optically), take some pictures with it and then look at the pictures. My experience with these lenses teaches me half of these lenses are great and half are not so great. I recently had some business with the Internet site "Digitaltruth" and am very impressed with this site. You can find all of the newest and most unusual films, paper and chemistry there and their customer service is great. I highly recommend that you give them a visit because you are sure to find many fine things there in the way of film, paper and chemistry you can't find anywhere else. This is close to a photographic candy store as I have ever found. Please note that if you intend to buy Kodak color chemistry from this site you should expect to experience a significant delay in the delivery of these chemicals. This is not the fault of Digitaltruth. The Kodak supply center is currently operating in a back order situation. What happens is orders are allowed to build up until they constitute a quantity sufficient to justify a production run and then Kodak manufactures enough chemicals to satisfy the order. If you place an order you will get the chemistry you order but it may take as long as eight weeks for it to arrive. So you will need to be very patient. 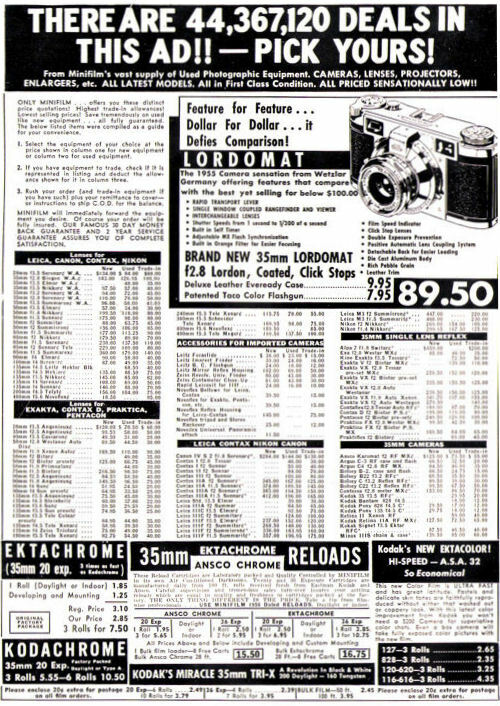 This is currently a universal phenomenon that is not unique to Digitaltruth but is being experienced by all sellers of Kodak color chemistry such as Adorama and B&H. If you intend to by Kodak or other Color brand color chemistry you should also carefully read the next section of this page about how to extend the shelf life of this chemistry. Many of the kind people who take the time to visit this site do their own color darkroom work. This has become increasingly difficult and expensive due to Kodak discontinuing all of the consumer sized kits for E-6, C-41 and RA-4 chemicals. Today it is necessary to purchase the large sizes and then dilute them down to meet the needs of the personal darkroom. Many are doing this. The problem with this is the shelf life of these larger sized chemistry packages is very short; much shorter than their utilization rate and the oxygen sensitive components tar up and become useless. Also, there is the problem of obtaining suitable repackaging materials for groups to use for "split up" group or camera club buys. There is a good reason for the short shelf life and there is an inexpensive solution to this expensive problem. The cause of short shelf life is the oxidation (tarring) of the oxygen sensitive components of these chemistry packages. Back in the good old days these oxygen sensitive components were packaged by Kodak in small glass bottles with high quality caps and the oxygen sensitive concentrates had a practically unlimited shelf life. Today they are packaged by Kodak in plastic bottles with caps that do not exclude oxygen effectively. The plastic bottles are not oxygen proof as glass is. Oxygen will enter the concentrated solution by diffusing through the thin plastic walls of the bottles and over a short period of time ruin the expensive and difficult to find and buy concentrate. The solution to the problem of premature oxidation is to repackage these oxygen sensitive solutions into glass bottles with high quality air tight caps. Fortunately there are some very good sources on the Internet where one can easily purchase small quantities of properly sized and very inexpensive brown glass bottles and the proper air tight caps that are identical to those that Kodak used to use. Please note that the need to put oxygen sensitive chemistry into glass applies to all makers of E-6, C-41 and RA-4 chemistry. The problem is not unique to Kodak but is caused by the fact that no plastic prevents the infusion of oxygen enough to provide a very long shelf life the way glass does. Please remember It is necessary to take extra care when storing and handling uncoated or non-safety type glass bottles because they break when dropped or abused. The nice thing about plastic is its resistance to breakage when dropped and it will take a lot of abuse. The choice to use uncoated breakable glass containers is yours to make and you take complete responsibility for any adverse results or damage resulting for choosing to use glass containers and any potential breakage or spills that may result from the use of glass containers. RA-4 Developer Parts A, B and C.
A tip for your lab is to also put your working solutions into brown glass bottles. You will be surprised just how well glass containers tremendously extend the shelf life of your expensive chemistry. All plastic allows oxygen diffusion into the bottle contents at a rate sufficient to shorten shelf life and it should be avoided except for bleach, fixer, hypo eliminator, stop bath, reversal baths, rinses and other chemistry that is not oxygen sensitive. If you are concerned about the imposition of "Hazmat" fees associated with the larger size of color chemistry this is explained in the next section. The cost of shipping the more modern large sizes of certain color chemicals has recently become increased by "Hazardous Shipping" fees that get tacked onto the regular shipping cost. The current Hazmat fee per package is $25.00 and this is the amount charged by UPS.The imposition of the Hazmat shipping fee is a new development that is directly related to the package size and nothing else. 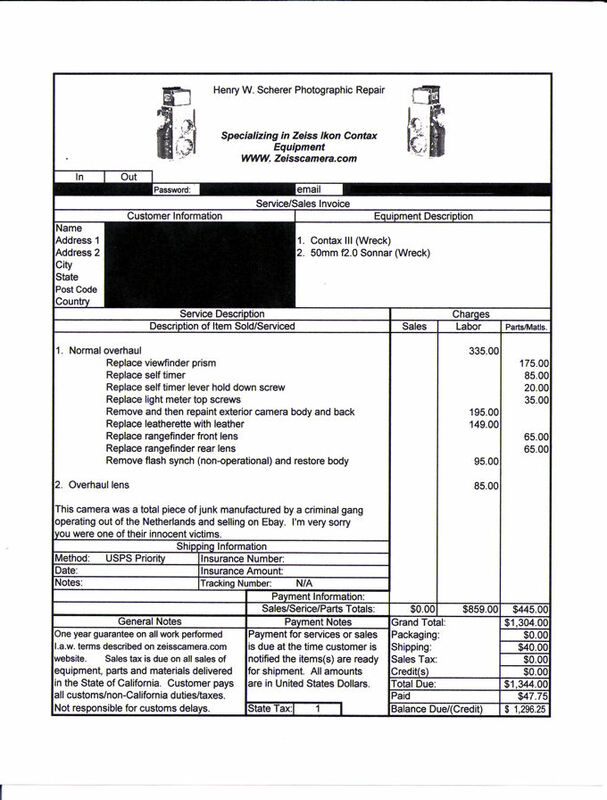 This fee is for the additional paperwork required for the shipment required by Federal Regulations. In the past the smaller consumer sized E-6, C-41 and RA-4 chemicals were shipped under a shipping exemption in Federal Regulations covering the shipment of small consumer quantities of chemicals listed in the Federal Regulations to be hazardous for being flammable or corrosive. This "ORM-D" exemption covers things like small containers of paint, fingernail polish, solvents, cleaners, compressed flammable gas, drain cleaner and photographic chemicals in small packages. However, with the increased size of the packaging of photographic color chemicals this ORM-D exemption is lost. When this exemption is lost the chemicals have to be properly labeled for shipment, per the Federal Regulations, and this costs money for the shipper and the shipping company to do. The purpose of this labeling is so that in the event of a spill that happens during transit first responders can know how to properly handle the situation. The fact a modern large size package of E-6 color developer or RA-4 developer requires a hazmat shipping fee does not mean it is any more dangerous than it was before when it was available in a small consumer package. It is merely the cost of the additional paper work that the shipper and the shipping company must prepare so that the package can be labeled in accordance with applicable Federal regulations pertaining to the size of the package. To minimize Hazmat shipping fee charges always make sure that if you order a case quantity that you instruct the seller that the order be shipped only when the full case can be shipped. If you accept a partial shipment then you will be assessed a separate $25.00 charge for each of the partial shipments required to make up the full case. If you order a full case of RA-4 developer and it is shipped in two shipments then the Hazmat fees will add up to $50.00. Hazmat fees can be minimized by combining cases of the same thing. Two cases of RA-4 developer can be put into one box and this box would only require one hazmat label and this would incur only one fee. Check with your seller beforehand to make sure you fully understand the shipping policies and what can be done to minimize the hazmat fees. If you do the math and are willing to dilute the larger sized packages you'll find the cost per gallon, even including the hazmat shipping fees, is much less than it was when consumer sized packages were available. It is just a lot less convenient and I yearn for the days when a 5 gallon sized complete kit of E-6 could be purchased at the local camera store for $50.00. Central Camera Co. has made the mistake of listing their small color kits in the Black and White chemical section. This company sells small kits in RA-4, C-41 and E-6. They also have a very attractively priced C-41 one liter powder kit and they sell Fuji RA-4 paper in all sizes. They also offer free shipping on orders over $108.00. They also sell all currently available Kodak color E-6, C-41 and RA-4 chemicals as well as black and white chemicals in small and large sizes. Their customer service and response is very good and they accept credit cards. The way to order on this site is to place your order then they will call you back. Their call back is very quick so there's no long waiting. This is a great site to visit. The nice thing about the Kodak Jr. Cartridges is that Kodak recycles them. Just return the exhausted cartridge to Kodak and they will send you a check for the value of the silver in your cartridge. I deeply regret to have to report that servicing of all models of Contaflex SLR cameras has had to be discontinued. The situation with this camera is simply that it is far too dangerous a camera for me to work on. The situation with the camera repair business is that if any particular camera model presents an unusual difficulty to repair or has a very low reliability success rate after repair it is too dangerous to the business. Camera disassembly is a time consuming and difficult labor and to continue in business the camera repair success rate must be extremely high, at least 99% if not better. 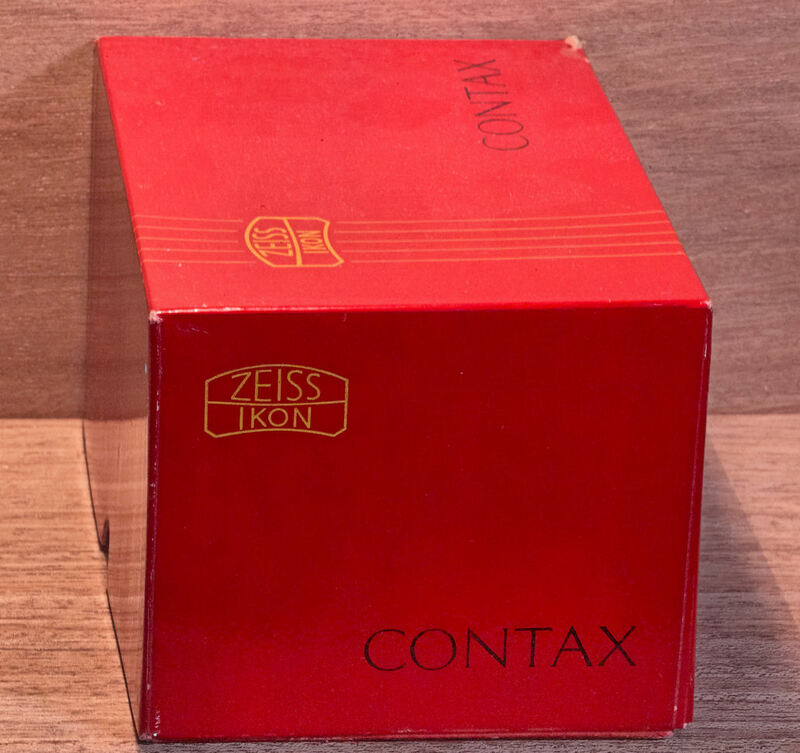 The fact of a camera being dangerous was amply demonstrated by the Contarex line of cameras which put Zeiss out of the camera business in 1974 due to reliability issues. 1. The first is many are simply worn out and are beyond repair. In the 1970's The Fuji Company performed a series of wear out tests on leaf shutters to find out how many exposures a typical leaf shutter could make until it was worn out. This is 10,000 exposures or about 277 rolls of 36 exposure 35mm film. My experience with the Contaflex is that a very great fraction of them were simply worn out and because of this cannot be repaired unless the complete shutter assembly is replaced. I have run out of new Contaflex shutter assemblies for the most popular models and expect never to have any more in the future. 2. The second reason is that the operation of the Contaflex shutter assembly is very complex. When an exposure is made the shutter closes, then the aperture closes down to the set opening, then the shutter opens and closes. The main problem with this scheme is that when Zeiss designed its cameras it very closely balanced the springs used in their cameras so that the spring force only slightly over balanced the friction forces, in a new camera. Because of the great complexity of the aperture control part of the shutter assembly Zeiss had to use parts that were extremely finely finished so they would slide against each other with the least friction. This worked very well when the camera was new. 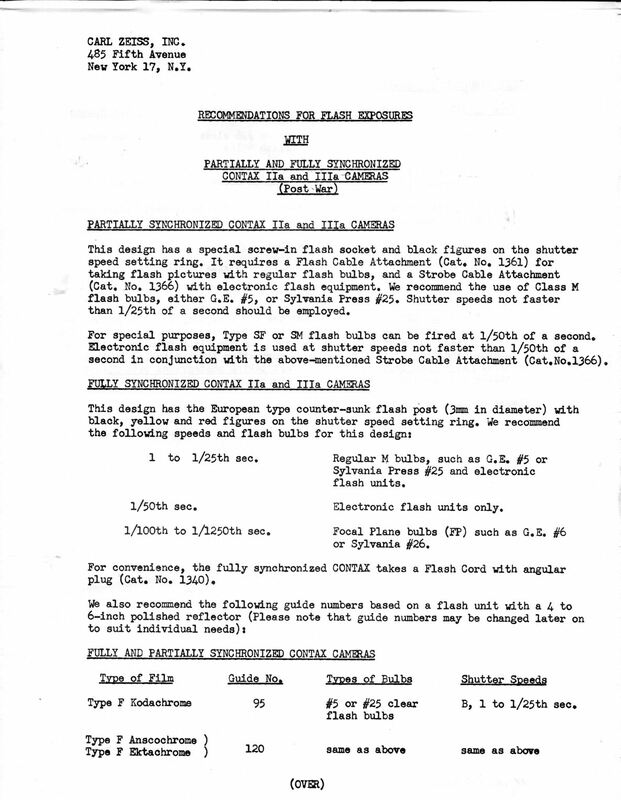 However, over the roughly 50 or more years since the Contaflex SLR was made time and storage conditions have caused a very thin layer of corrosion to form on the hyper fine finished parts. Today, it is possible, with ultrasonic cleaning to remove this corrosion layer, but underneath the corrosion layer the underlying metal surface no longer has its super fine finish. The result is increased friction and this friction is so far greater than the pressure of the springs that operate the aperture control system there is absolutely nothing that can be done to make it at least as reliable as when it was new. The means the camera is, for all intents and purposes, un repairable. I regret to have to come to this conclusion but the simple fact of the matter is cameras do not lie. They always tell the truth about themselves and I've spent far too many weeks struggling with Contaflex SLRs to be able to come to any other conclusion about them. The long and the short of it is the camera is too complex, too finely balanced, and too susceptible to the permanent damaging effects of simple ageing. 3. Some years ago I purchased the last parts inventory of Contaflex parts from the last owner of the Official Zeiss Ikon Repair Centre in Canada. He had not sold any of these parts after Zeiss went out of the camera business but kept them for his own use because he was a Contaflex collector. In this group of parts were 20 Contaflex Super B shutter assemblies that had been described to me to be new. Recently I had the need for a new shutter assembly for a Super B and so looked through them. The shutters were not new they were all old but were in new Zeiss Ikon plastic bags. This tells me that the Super B was a super unreliable camera when it was new and that it was the standard practice of Zeiss repair technicians to not attempt repairs but to simply change out the entire shutter assembly. This tells you that the Super B that may be inherited from a father, grandfather or grandmother may not have been very reliable when it was new. There's no way for me to be able to identify a Contaflex SLR that needs a new shutter assembly except to take the one that is inside the camera apart, clean and lubricate it, and then put it together. This is when a shutter displays what it really is. If the shutter is worn out then all this labor is wasted. 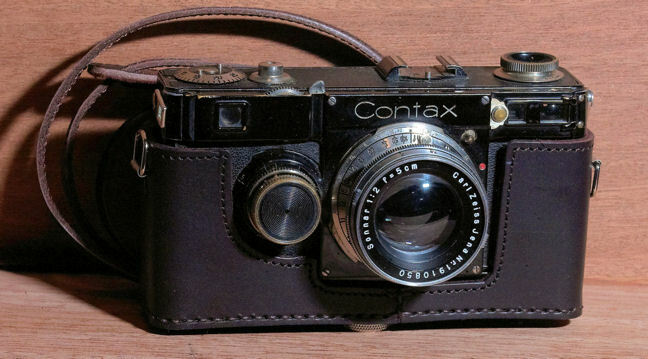 The fact of the Contaflex SLR is that at least as many of them were not good to begin with and I am sure the number of these cameras easily equals the number of them that are simply completely worn out with both sets of cameras being beyond repair today. 4. The most popular Contaflex SLR camera today is the Super B with CDS battery operated meter. The meter sensor is located just above the eyepiece. In front of the eyepiece there is a cemented split prism that reflects part of the light into the light meter sensor. The problem with this prism is it tends to separate and when it does the accuracy of the light meter is strongly affected. In most cases of light meter problems with the Super B CDS model the only fix is a new prism which is fairly expensive. The problem is the only way to identify a bad light meter prism is to take the camera apart. The rest of the light meter system is spread throughout the camera and so to repair it requires complete camera disassembly. This is very costly in terms of time and labor and this cost is too great for a small shop like mine to withstand. I have to say that the Contaflex SLR is the most difficult to work on camera that Zeiss ever made and I can easily understand how it would be so many problems to the technicians at the Official Zeiss Repair Center when it was new. Parts: In the future I will be setting up a sales page with detailed pictures, of all my stock of Contaflex parts and they will be made available for sale. If you have a need for a part please use the above email link and I'll be glad to help you. But please keep in mind it is a considerable amount of time and work for me to find the part you need, to package it and to take it to the post office so these costs must be included in the cost of the parts you may purchase. Recently it has become apparent that some lens sellers are expertly applying lens scratch removal paint to the front and rear surfaces of valuable lenses, including Leica and other lenses, to improve their appearance for sale to make them fetch a much higher price than they actually deserve. The problem is this paint ruins the optical performance of the lens. When a painted lens is cleaned and returned to its owner the sudden appearance of the many cleaning scratches and coating loss that were hidden underneath the paint comes as a great shock. In the past two years I have received two painted lenses coming out of a prominent lens seller operating in Los Angeles. If you intend to send a lens here for overhaul that has been purchased from any source in Los Angeles, or which you otherwise suspect to have been painted, please contact me prior to shipping the lens here. I will be able to advise you how you can determine if the lens has been painted prior to shipment. Every camera or lens that I have seen over the past five years whose source has been the Netherlands has been a wreck inside. They have all been carefully prepared with very expertly applied fresh (russian made) exterior paint and expertly made modern plastic leatherette to look very good on a Jpeg. But inside they have been ruined. There have been absolutely no exceptions including, and most especially, cameras, accessories or lenses sold on Ebay. I have also noticed a very peculiar coincidence that whenever I am forced to tell a camera owner about the actual internal condition of the camera, and the extra charges for necessary repair parts, the next thing that happens is that my email in-box is bombarded with malicious email originating from russia. Please take my advice and DO NOT under any circumstances, no matter how good it may appear, buy a camera, lens or accessory from any source in the Netherlands. My experience is that a great many of these cameras and lenses are actually source out of russia where they have been butchered. This advice also applies to sending your camera to russia for repairs. I have seen enough of these victim cameras to know that any camera sent to russia for a cheap repair is butchered. These cameras are extremely difficult to repair, are frequently impossible to restore completely, and are just not worth all the time, trouble and expense involved. Just DO NOT DO IT. Please keep in mind that Shills and Touts working for russian camera repair outfits operate regularly on the Internet and most especially on the Rangefinder forum. If you are in doubt just ask me and I'll tell you what I think about a source. Please understand that if you buy a camera from the Netherlands, and you send it here to be repaired when it fails, it is extremely likely that the additional charges for necessary repair parts will be extraordinarily high. The camera models I have seen from russia and the Netherlands are the Contax I, II, III, IIa, iIIa and Super Ikonta along with the Contarex Bullseye and Super.. All of these cameras were inaccurate, inconsistent, and unreliable. They all looked good on the outside and had been wrecked on the inside. I've also seen oiled separated lenses along with scratched and hazed lenses "improved" with clear lacquer applied to the front element surface. The simplest rule is DO NOT BUY ANTYHING FROM THE NETERHLANDS. This four page Zeiss Technical Publication was originally printed in 1976. 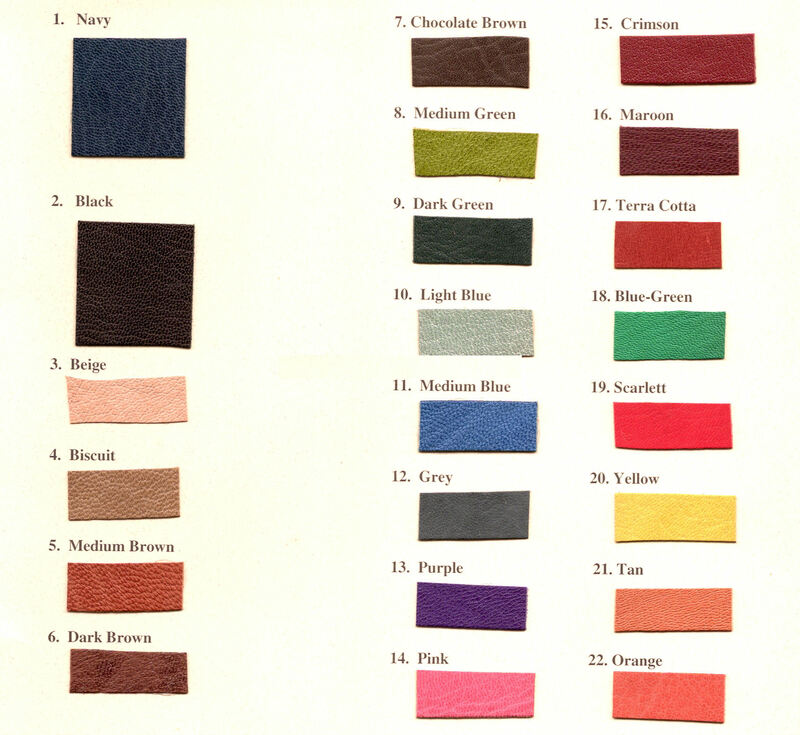 It was found in a collection of Zeiss papers that were recently purchased. 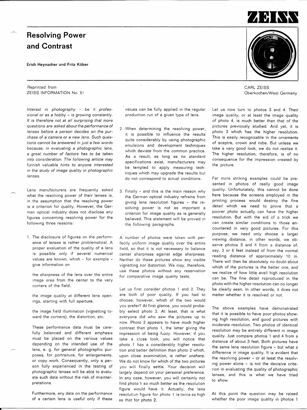 It explains and demonstrates the Zeiss position on lens contrast and precision in four pages with such clarity and completeness there is no doubt that once you have read it you will understand everything about this topic. This document contains pictures that are crucial to the understanding of this article and so it has been scanned in very high resolution Jpeg format so that they will reproduce on your computer with sufficient clarity. 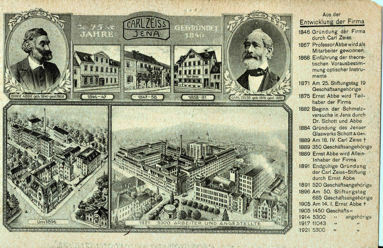 Recently a very rare postcard printed by Carl Zeiss in 1921 to commemorate the 75th anniversary of its founding came onto the market and was obtained by Zeisscamera. It is so unusual in its information and printing quality that high definition scans of its illustrations have been provided for you to enjoy. The postcard was intaglio printed from an engraving in the same manner as U.S. Currency and the quality is amazing. Please use the provided link to go to the Zeiss Postcard Page. They are a good old fashioned full service shop that does just about anything and deserve your custom. Please do not include any lens caps, body caps, cases, straps or other minor or major accessories with your camera or lens when they are sent here for service. I am not responsible for damage or loss to these items. Often times lens and camera body caps will become loose during shipping, can get caught up in the packing and get lost. If you send a camera or a lens here for service I will do everything I can to make sure it is returned with everything that came with it. But if you find a cap or a case or strap is missing or damaged I have no responsibility to replace or repair such items. You include them at your own risk. If your Contax back leather has been ruined by being cut, slit and butchered to temporarily remove the Zeiss bumps it can be recovered and completely restored to original new condition. When this is done the Zeiss bump problem will be permanently and properly cured so that it never returns. If you have a back that needs attention contact me using this link: Mail To Superwide. Back recovering is done quickly and is not subject to the waiting list. Just about anything is possible and so if you have a question of any kind about leather, stamps, personalization please ask. 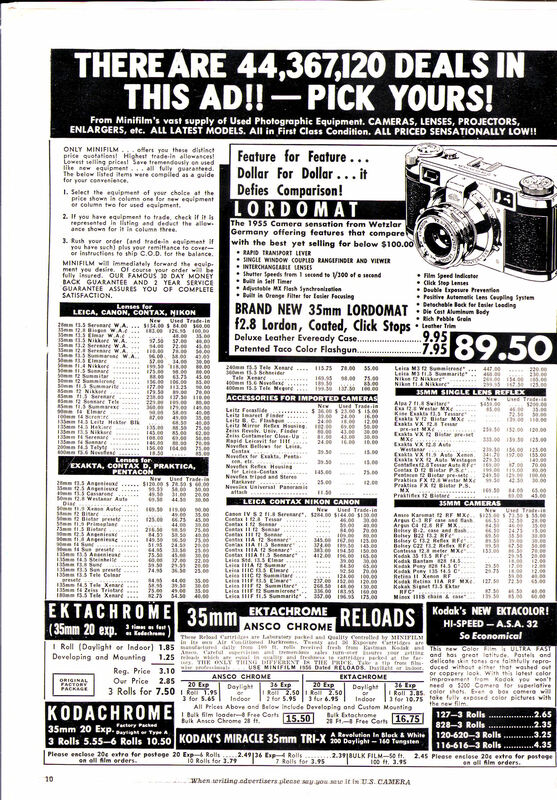 An original full page New York camera store advertisement from 1955 containing many Zeiss items recently became available and its posted here for you to see and remember the good old days. If you want to view this advertisement full size (1 Mb) just click on the picture of it to pull up the full size view. The popularity of "micro fiber" lens cleaning cloths is not a good thing. These cloths hold the dirt they pick up and become lens sand paper over time. It seems that every generation of new photographers gets marketed some lens cleaning solution which is lens ruination in disguise. If you want to clean your lenses properly use dust off or a fine sable hair brush to remove loose particles. Then, if this is not enough, gently use a new cotton swab moistened with clean water containing a small amount of soap or detergent. If you want a deluxe solution to the lens cleaning problem obtain a Zeiss lens cleaning kit and keep it close. DO NOT USE MICROFIBER CLOTH - IT IS LENS RUIN IN DISGUISE. I purchased several of these wonderful lenses and have performed a very detailed and thorough examination with the conclusion there has been a big factory mistake and they are not Nikon lenses as advertised, but have been made for the Contax camera. I have recently been able to compound and hand manufacture two paints which are in all respects the equal in appearance and characteristic of the paints used by Zeiss to paint the Contax I, II, III, IIa and IIIa cameras. These paints are not modern but are of a very old classic formula used before WWII. One paint is high gloss black and the other is the very fine matte finish black. Both finishes are hard, chip resistant and solvent proof. These paints are very difficult and expensive to produce so it will not be possible to sell them individually, they can only be applied here. Both paints require a three day elevated temperature baking schedule to fully cure and so painting will only be available as part of a regular complete overhaul of the equipment involved. If you have a Sonnar lens or any black painted lens by any manufacturer with a black painted front end that has been dented the chances are very good it can be repaired without any sign it has ever been damaged. If your desire is to have your Contax I repainted please keep in mind that when Zeiss engraved the camera body it engraved through the paint. This means that when the camera is repainted the original engravings into the metal, which are very shallow, may be over covered. I have been seeing a substantial increase in Sonnar lenses with Surface Defects and Internal Separation that have been tricked up with wax to temporarily hide surface defects and oil to temporarily correct internal separation. Find out all about how to protect yourself against being cheated by someone selling a tricked up lens. The recent upsurge of interest in the German made Contax camera has resulted in confusion regarding the kind of service needed to allow these rare and unique cameras to be put back into regular operation without running the risk of damage caused by insufficient lubrication. I have been asked numerous times recently what is the main difference between a complete overhaul and a CLA and why an overhaul costs more and is more time consuming than a CLA. Since this article was first written it has become the practice of many operators who sell their Contax camera services on Ebay and elsewhere to use the word "overhaul" to describe the things they do to a camera at a lowball price. I've seen several of these "overhauled" cameras along with their receipts. The receipts have the word "overhaul" repeated all over the page, but inside the cameras all I found was work constituting a cheap, fast and superficial CLA. The one sure sign of a real complete overhaul where the worker has true confidence in the correctness and thoroughness of his work is a ONE YEAR WARRANTY. If you can't get a ONE YEAR WARRANTY don't have the work done there. The key is confidence. Why should you have confidence in work where the worker has none in what he has done? A nice long no-none sense quick turnaround warranty is the certain and sure sign of real craftsmanship, thoroughness and care.